The outfit in question features a half-tucked button down, rolled-up khakis and (what appear to be) suede Oxford-style shoes. 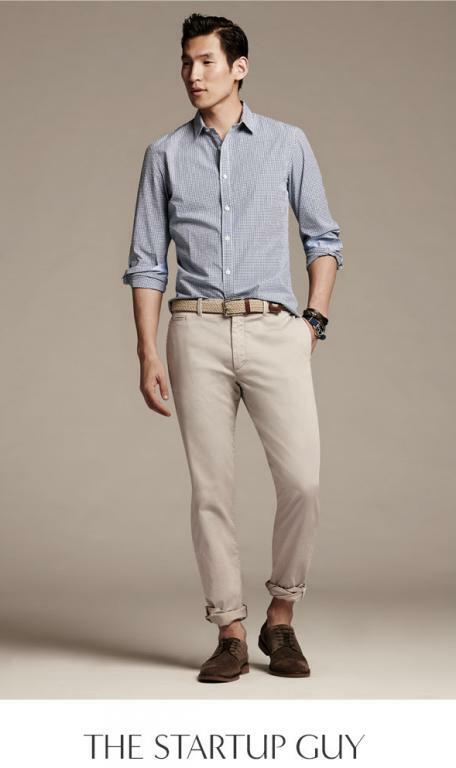 It's part of Banana Republic's new styling guide to help busy male professionals create stylish outfits without having to spend too much time or energy, Banana Republic spokesperson Liz Nunan told Benzinga. “We want our men’s shoppers to look at us as a resources for easy styling so they can get back to work, all while looking great,” Nunan said. Banana Republic is smart to approach this demographic early in the game, image advisor and men's style coach Alice Kim told Benzinga. She's noticed a developing shift in the fashion wants of entrepreneurial men, who are looking to “graduate” from the typical hoodie-and-jeans look that is associated with startup guys. “They want their look to be smart enough to be taken seriously for business, but in ways that show personality and creativity that sets them far apart from the typical cubicle drone,” said Kim. Fashion psychologist Dawnn Karen told Benzinga that Banana Republic's startup guy look will add a physical element of allure or “beauty,” to compliment the entrepreneur's brains. While the “corporate” and “creative” guys also targeted by the email might be interested in Banana Republic's fashion line, it might not be a startup worker's cup of tea. For Jeff Kear, entrepreneur and founder of Planning Pod, his first reaction to the clothing line was short and less than enthusiastic. Kear said he doesn't like people telling him what to wear in the same way he doesn't like being told how to run his business. Susan Baroncini-Moe is an entrepreneur and founder of Business in Blue Jeans. She told Benzinga that no startup guy she knows wears clothes like the ones Banana Republic is offering. “In fact, most of the startup men and women I know are professionals who are frankly far more focused on the excitement and stress of the startup process than on what they’re wearing,” she said. Baroncini-Moe said that the dress attire for any startup worker really depends on their agenda for the day. Banana Republic's marketing message may come off as somewhat nebulous, brand marketing manager and LegalAdvice.com founder Matthew Reischer said, because there really is no single “startup guy” look. “Being an entrepreneur fashion-wise spans the minimalist look of Steve Jobs to the dapperness of Elon Musk to the no-frills hoodies of Mark Zuckerberg,” said Reischer.